Occasionally we can’t cover an exhibition until it’s too late. But we want to share some excellent shows that recently closed in Los Angeles: Heather Flood’s Punk’d at SCI-Arc Gallery and WUHO Gallery’s Linear City and The Big Atlas of L.A. Pools. 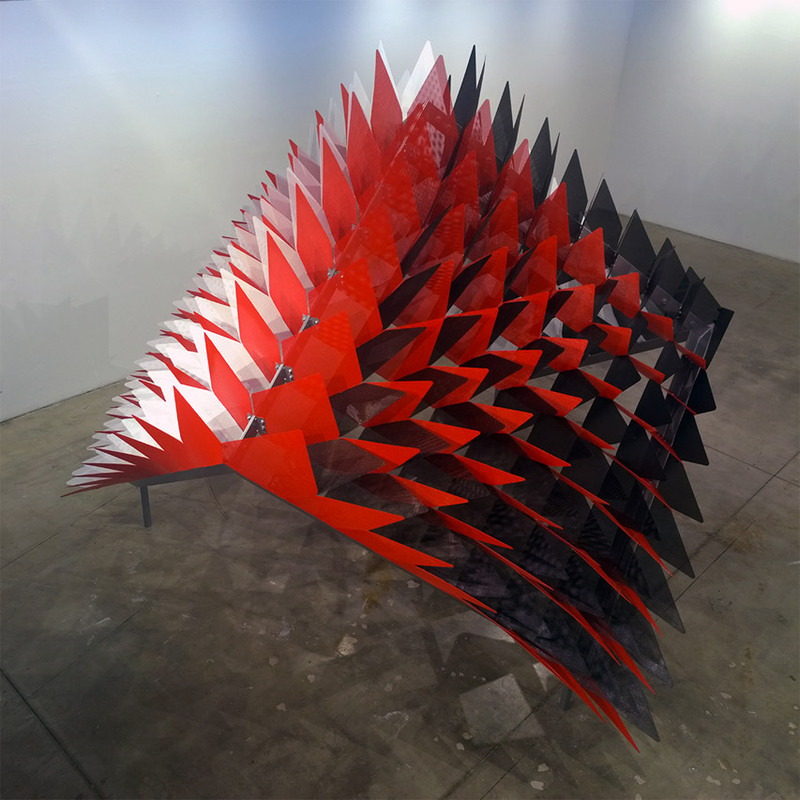 For Punk’d, Flood and her team arranged strips of interlocking, twisting aluminum into spiky configurations to demonstrate how two-dimensional graphics could be translated into three dimensional construction, as if the gradient grid of colors were textiles. Its bright red and white color palette was taken from the British Royal Family’s Balmoral tartan, a slightly subversive Punk Movement shout out. “I wanted the graphic pattern to emerge out of the logic of construction, explained Flood, who wanted to move away from the common use of graphics as appliqué. 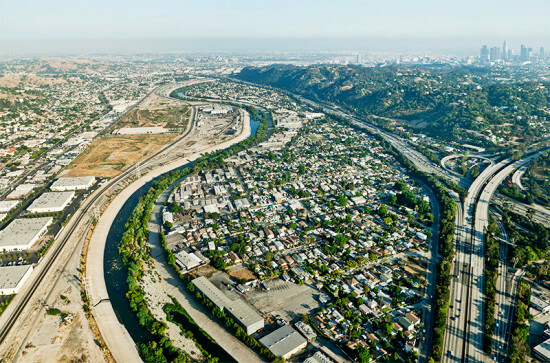 In Linear City, photographer Lane Barden captured three of LA’s most iconic linear stretches — the Los Angeles River, Wilshire Boulevard, and the Alameda Corridor Railroad Trench–in their entirety in a sprawling visual progression along one of the long gallery’s walls. The immensity of these infrastructural projects came to life, revealing the sprawling scope of the city’s midcentury engineering ambitions. Details like LA River’s wildlife, and Wilshire Boulevard’s stunning tectonic and programmatic diversity changed perceptions of viewers used to seeing these urban staples from a much more static and singular perspective. 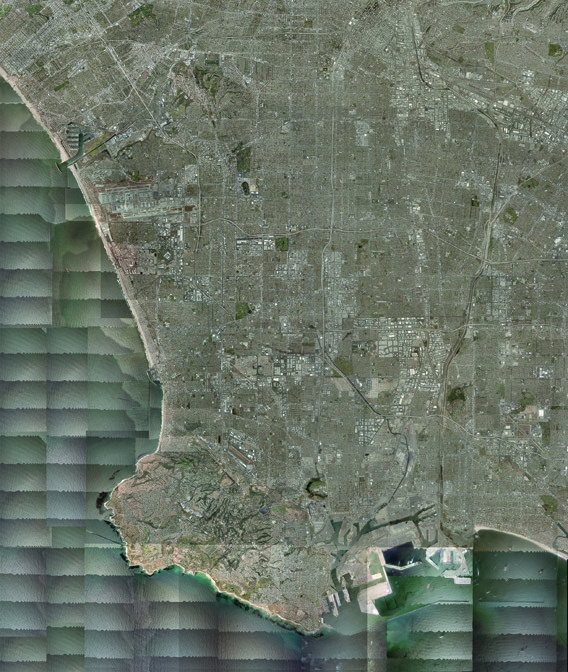 On the other wall in The Big Atlas designer Benedikt Groß and cartographer Joseph K. Lee mapped every neighborhood in Los Angeles through methods such as crowdsourcing, outsourcing, and geo-mapping to chart 43,123 swimming pools. 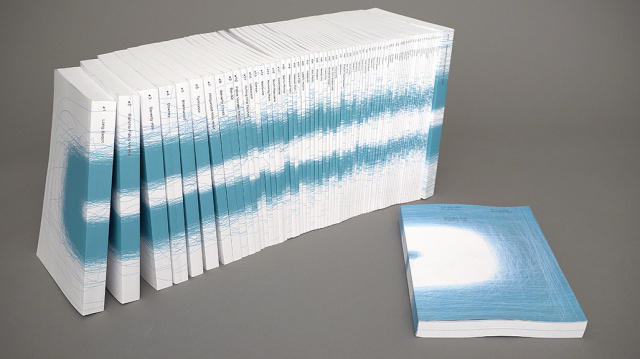 Their effort—presented in volume after volume of booklets laid out on a long table—didn’t just illuminate for the first time where all the city’s swimming was taking place, but it explored alternative methods of harvesting very specific (and incredibly voluminous) data in the city.